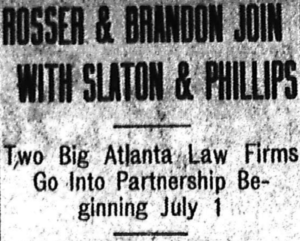 The law firm of Rosser & Brandon and Slaton & Phillips have formed a partnership beginning July 1, and will be known by the firm name of Rosser, Brandon, Slaton & Phillips, with offices on the seventh floor of the Grant building, the Slaton & Phillips suite being enlarged to accommodate the new firm. There will be in the new firm the following: Luther Z. Rosser, Morris Brandon, John M. Slaton, Ben Z. Phillips, J. H. Porter, Stiles Hopkins, Luther Z. Rosser, Jr., Verlyn B. Moore and James J. Regan. During his term of office as governor of Georgia, Mr. Slaton will have no working connection with the firm and will not participate in the firm’s earnings. Mr. Slaton has been in the practice of law for twenty-six years, and for nineteen years he and Mr. Phillips have been law partners. During that time with his partner he has built up a clientele which he desires preserved, and it goes without saying that the new firm will be more than able to accomplish this purpose. The consolidation of the two firms has been contemplated two or three months, and has been more or less generally known among Atlanta lawyers for several days. Announcement of the consolidation was reserved until today by the Journal at the request of both firms. The new firm will be one of the largest and strongest in the state. Messrs. Rosser, Brandon, Slaton, and Phillips stand at the very top in the Atlanta bar, while the younger men of the firm are all of proven ability. The firm’s suite is on the Forsyth street side of the Grant building and takes up nearly half of the seventh floor. The library made by the consolidation of the firm’s collections will consist of several thousand volumes and will probably be the largest in the city.